Here is a value pack containing natural ingredients to protect and maintain your hair and skin, with a shampoo and hair treatment for healthy, shiny hair; a replenishing conditioner that leaves your hair soft, nourished, healthy-looking and easy to style; and a body wash to gently cleanse and exfoliate while maintaining optimum skin health. Our Replenishing Shampoo has been created to maintain and restore hair, defriz or detangle, and deal with hair that’s unmanageable. This Pawpaw-based Replenishing Shampoo uses natural active ingredients to help maintain and manage your hair. It’s an indulgent shampoo containing 10% of our concentrated McArthur Pawpaw Extract™ which aids in rehydrating and restoring the hair’s natural shine and beauty. It is suitable for all hair types and everyday use. Our Replenishing Conditioner leaves hair soft, nourished, healthy-looking and easy to style. It’s an ideal natural product for healthy hair and also for hair that’s dry and brittle, perhaps with split ends, and sometimes coarse, frizzy, flyaway or generally unmanageable. Containing McArthur Pawpaw Extract™ our Replenishing Conditioner is the perfect partner to McArthur Skincare's Replenishing Shampoo providing a luxurious, thick moisturising treatment that’s designed for all hair types. It uses Pawpaw (Papaya, Papaw) to nourish and restore, creating soft, easy to manage hair. Our Complete Skincare Body Wash uses natural ingredients for a refreshing and effective all-over clean that’s gentle on the skin. It is a rich moisturising body wash which leaves the skin soft and smooth, by cleansing, exfoliating and revitalising the skin and pores. It contains 15% McArthur Pawpaw Extract™ and is suited to all skin types including sensitive skin. The main active natural ingredient of the Replenishing Shower Pack is Pawpaw (Papaya, Papaw) used in combination with natural ingredients including those derived from Coconut, Citrus Fruits and Jojoba Seed Oil. Pawpaw (Papaya, Papaw) is the skin’s natural friend, packed full of vitamins, antioxidants and enzymes which give it a natural ability to rejuvenate the skin and scalp. We perfected our McArthur Pawpaw Extract™ to harness the special properties of Pawpaw (Papaya, Papaw) in a concentrated form. Our products contain higher concentrations of Pawpaw than other products on the market – just compare. McArthur Pawpaw Extract™ is manufactured exclusively by us and it is sometimes referred to as liquid gold! 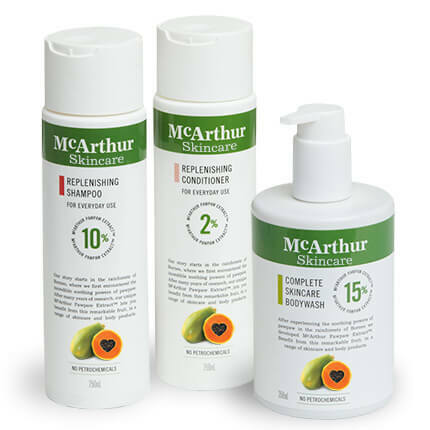 McArthur Skincare's Replenishing Shower Pack has been formulated to restore and maintain hair and skin to its optimum condition using natural ingredients and excluding harsh additives - giving your hair a natural shine which is easy to manage, and a refreshing body wash that purifies the skin. All products in the McArthur Skincare's Hair Care and Skin Care ranges use natural ingredients. 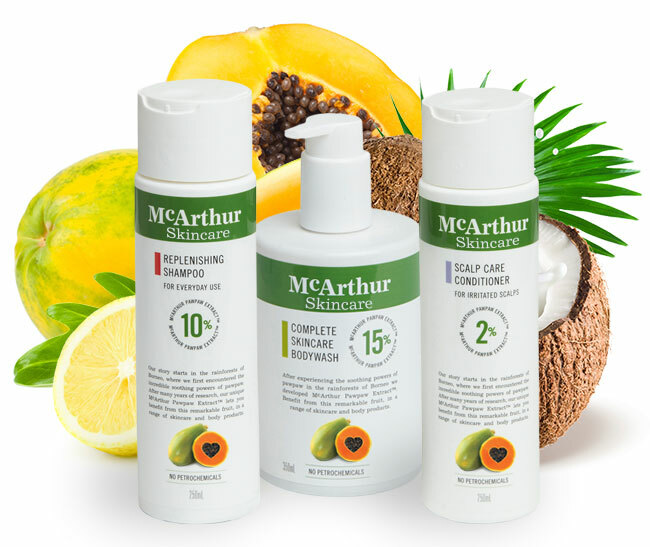 Keep your McArthur Skincare's Replenishing Shampoo, Replenishing Conditioner and Complete Skincare Body Wash stored at a temperature under 30° Celsius. Active natural ingredients have been carefully selected and blended by our McArthur Skincare's specialists to create our Replenishing Shower Pack. Apply a small amount of paw paw body wash to a sponge or loofah and massage onto body to create a lather.